One of the big accomplishments for the Fish Lead-Free team this summer has been the donation of “starter kits” with lead-free tackle to the Hooked on Fishing – Not on Drugs program run by the Maine Department of Inland Fisheries and Wildlife. We are proud to be working with a program that aims to promote family togetherness through fishing! Starting next week, children participating in HOF will receive their own tackle box with the Fish Lead-Free logo on it, and a sampling of tackle made with non-lead materials. We also included information about how to find online retailers and how to learn more about the importance of lead-free fishing! A close up of the materials included in each tackle box – a bumper sticker, lead-free sinkers and jig heads, and information about how to find out more on our website! We are excited to be able to provide these materials to new anglers, and we hope that they take these tackle boxes with them and share what they learn with their peers! We were able to give several hundred boxes to the HOF program, and we will continue to use the extras during our presentations and other events. The boxes all stacked up and ready to go! Thanks to those at Maine Audubon who took an hour out of their afternoon to help us with all the assembly! And thank you to the HOF program for working hard to help children learn valuable life skills through fishing; we are happy to be collaborating with such a great program. If you are interested in learning more about the Hooked on Fishing program, click here. And as always if you are interested in someone from the Fish Lead-Free program coming to your event, please contact us at fishleadfree@maineaudubon.org. Fishing Lead-Free Hall of Fame! The Fish Lead Free project is looking for anglers to submit photos of the biggest fish they have caught using lead-free fishing tackle. We want to find the biggest fish that have been caught for our lead-free fishing hall of fame. The angler with the largest fish will have their picture put on our website cover page for all to see, so get fishing! 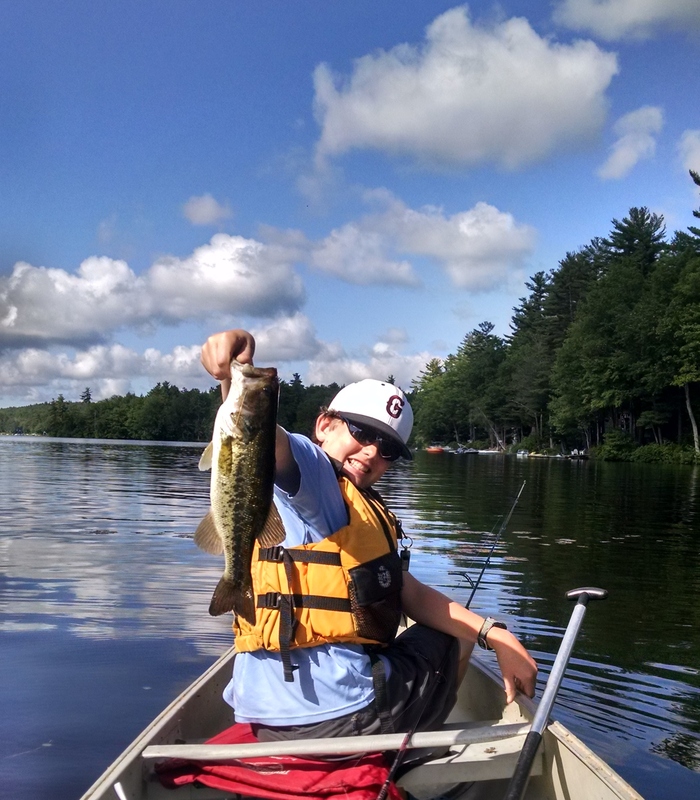 Below we have our first entry, an 18 inch Large Mouth Bass caught by Conor Nadeau from Cumberland, Maine using tin split shot. If you think your fish deserves to be in the Lead-Free Fishing Hall of Fame send us an email with your picture (high resolution JPEGs only), your name, lake location, what tackle you used, and the size of the fish in the picture (no cheating!) to fishleadfree@maineaudubon.org.